Hi all! It's Deasy here. 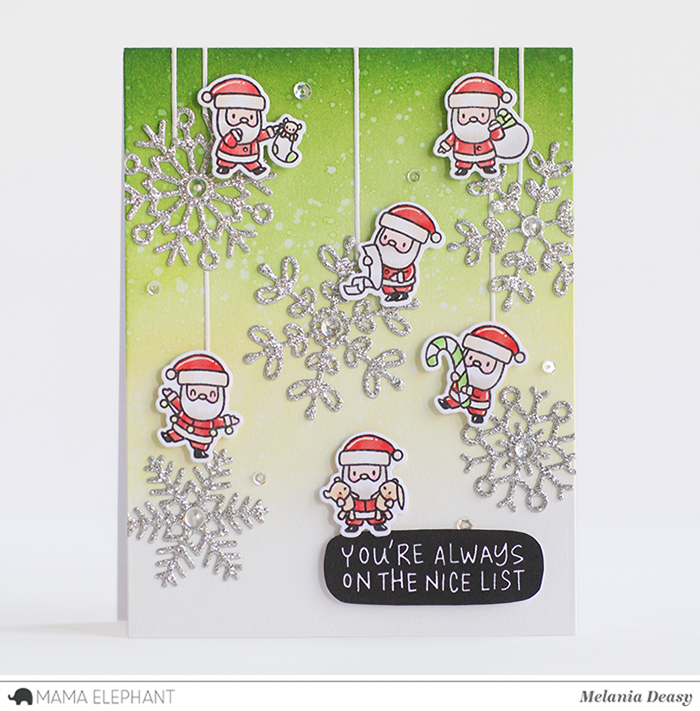 Today I want to share my card for Mama Elephant featuring Little Santa Agenda stamp set. The Santas are so adorable with many poses and super fun! I stamp, color the images using copic then die cut it. To color the background, I'm using Dye Ink with blending tool then splash water with my brush. For the embellishment, I add some clear sequins and clear droplets. This is truly adorable !! Risk playing online casino games professionally. Such a cute design, and I love your beautiful snowflakes. To win the game with risk. Holiday Palace Online gambling gamblers are ready to help make each of them have access to a wide range of online games and many pleasures. All customers have the opportunity to participate in the fun of playing online casinos are very convenient. With the way we have a way of playing online games to participate in activities on the online games are very easy. Really a lovely card in lovely colors! Win with the casino to give players luck.